The remains of the Manx2 flight that crashed on landing at Cork airport in February 2011. A LAWSUIT HAS been filed in a US court against the manufacturers of an aircraft which crashed at Cork Airport nearly two years ago on behalf of four of the six people who died. A complaint filed in the Cook County circuit court in Illinois earlier this month details the case being taken against M7 Aerospace, Honeywell International, and Woodward Governor Company, the manufacturer and sub-component manufacturers of the small aircraft. Six people died and six others survived when a Manx2 flight – whose operation was leased to Spanish aviation firm Flightline BCN – from Belfast to Cork crashed at Cork Airport on its third attempt at landing on the morning of 10 February 2011. The Metro III plane involved in the crash was manufactured by Fairchild which is now owned by M7 Aerospace, the US subsidiary of the Israeli defence contractor Elbit Systems. M7 as well as Honeywell and Woodward are being sued by the administrators of the estates of four of those who died in the crash including the Michael Evans, Patrick Cullinan, Richard Noble, and Brendan McAleese. The plane’s pilot Jordi Gola Lopez and co-pilot Andrew Cantle also died in the crash. A lawyer for the plaintiffs and some of those who survived the crash, James Healy-Pratt, says it is his clients’ view that the main cause of the crash was the pilots’ decisions to make two attempts to land the plane before it crashed on the third attempt. He was referring to an interim report by the Air Accident Investigation Unit (AAIU) which was published last February and identified a problem with the sensor on the right-side engine of the plane. The report found that there was a flaw with the fuel transmission to this right-hand side engine which could have been giving more power than the left-hand side engine. This means there was a potential for the plane to be unbalanced as it landed. “The aircraft may well not have ended up inverted on its back had both engines been delivering equal and balanced power,” Healy-Pratt, from specialist aviation lawyers Stewarts Law LLP, said. “Indeed the power imbalance probably resulted in one wing dropping and hitting the ground first, resulting in the aircraft rolling over. “This is important in the context of the passenger deaths and injuries. Often, a low speed landing in an upright position results in less severe injuries,” he explained. A 17-page court document, seen by TheJournal.ie, was filed in the Cook County circuit court on 6 December by Floyd Wisner from the Wisner Law Firm in Illinois, acting on behalf of the plaintiffs. In the document the plaintiffs allege that the aircraft “contained conditions which rendered it defective and not reasonably safe”. They allege that M7 Aerospace is liable for the “defective design, manufacture, assembly, testing and sale of the accident aircraft” by its predecessor – Fairchild – and also claim that it “negligently breached its duty of care”. The document also alleges that M7 “knew” that the aircraft in question was “defective and unreasonably dangerous” because of the defects identified. The defendant, M7, is said to have failed to “advise and warn the owner and operator of the accident aircraft” of these defects, and thus allegedly breached its duty of care. An attempt to contact M7 Aerospace through Elbit Systems was unsuccessful at the time of publication. The final report from the AAIU into the Cork Airport crash is due next year. 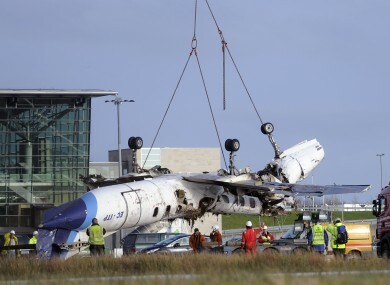 Email “US lawsuit taken against manufacturers of Cork Airport crash plane”. Feedback on “US lawsuit taken against manufacturers of Cork Airport crash plane”.